Archive for tag "Ecosummit Düsseldorf 2012"
One Peak Partners and Morgan Stanley Expansion Capital are on board. Together, the private equity firms invest 22 million euros in Berlin-based EcoIntense. The late stage software startup has been cashflow positive since 2012 and even debt free since 2014. But “it’s almost like an old saying: you should have a financing round, when you don’t need any cash,” Markus Becker, Co-founder of EcoIntense explained his reason for raising capital anyhow. How can you guarantee the performance of solar panels over a long period of time, let’s say 20 years? By simulating sunshine and testing the solar panels in a controlled lab environment with powerful and energy efficient lamps, e.g. Heliospectra LEDs. Chokri Mousaoui (CEO) and Stefan Roest (CTO) co-founded Eternal Sun in 2011 after they developed their first solar simulator prototype at Delft University of Technology. As their second and third prototype were already paid by pilot customers, the founders managed to reach product market fit very quickly and bootstrap their smart green startup to €1M revenues in 2014 while keeping a clean 50:50 cap table until their Series A. In July 2011, they moved into the incubator YesDelft where they are still located. The role of TU Delft and its ecosystem cannot be overestimated as 9 out of 11 employees were educated at the university. We first saw Chokri pitching in front of the Climate-KIC accelerator jury at Utrechtinc on 5 July 2012. 2 months later, we went together on the first Climate-KIC USA Startup Tour to Silicon Valley, Washington and Boston. 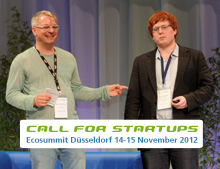 Then Stefan came to Ecosummit Düsseldorf 2012 in November to look for investors. 9 days to go until ECO12 Düsseldorf. 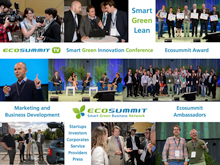 The perfect moment to do some serious pattern recognition and talk about the cleantech startups to be featured on stage – and Ecosummit TV. Our second conference this year enjoys again a very high startup density: 26 startups present new solutions for accelerating the Energiewende (energy transformation). The Internet of things and cleantech grow together. More and more green startups develop smart hardware products that have an IP address. The startups pitching at Ecosummit control cars, helicopters, charging stations, PV systems, wind generators, batteries, street lights, homes and even entire cities over the Internet. Smarter, greener, leaner – that’s the way we want them. We call all cleantech startups to pitch at Ecosummit Düsseldorf 2012 on 14-15 November at the Langen Foundation, Germany’s most beautiful private museum designed by Japanese architect Tadao Ando. ECO12 Düsseldorf is our 4th international conference and brings together startups, VCs, corporates and utilities to accelerate smart green innovation. So far we confirmed 15 sponsors and 43 speakers including 26 startups. Startups can win a free 8-minute pitch and get in front of Europe’s leading cleantech VCs and Corporate VCs. Please apply by sending us your investor presentation as soon as possible, application deadline is 7 November 2012. Bonus: All startups at ECO12 Düsseldorf get the Autodesk Product Design Suite Ultimate Edition for free.